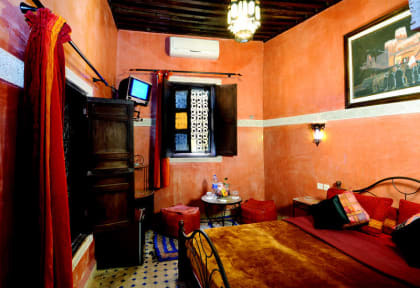 Riad Anass Alouali is located in the quartier Talaa Sghira, in the heart of the ancient Medina of Fes. Our hotel is known by its great hospitality and we hope that our customers respect our conditions. Our hotel workers are at their service at any time. It's advisable to not talk with hustlers guides who are scattered in the streets. We look forward to welcoming our guests into Fassi life with the same hospitality Morocco is famous for. Free breakfast is served daily. Fes is the third largest city in Morocco after Casablanca and Rabat. The old town Medina is the oldest in the world and under Unesco protection, unchanged since the 12th century. The deep blue of the ceramic is one of the characteristic symbols of Fez. 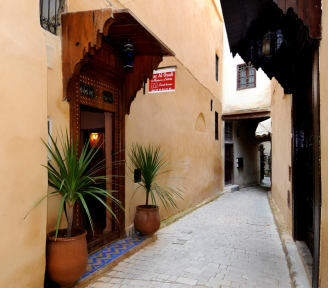 Its international past makes it one of the capitals of Muslim civilization along with Damascus, Baghdad, Cordoba, Granada… Riad Anass Alouali is located in the centre of the ancient Medina. Riad Anass Al Ouali Fes is nearby the main street (Talaa Sghira) and it's not far from the blue gate (Bab Boujloud) around 400 metres. The property is surrounded by a lot of restaurants, cafés. Riad Anass Alouali offers a wide range of rooms. We have single,double,triple,family rooms, all with private bathrooms. Taxes not included - Local occupancy tax 2.00 euros per person per stay.